We have three sections for your K9 kids to stay during their visit. One is called the “Wagg-N-Tails Inn” one is called "Pampered Paws" and the other one is called the “Canine Country Club Villa”. All are part of the “Happy Tails Camp” experience here at the Pet Tailor’s facility. We offer different sizes from a small single pet space to ex-large for multiple family pets to bunk together. Every effort is made to select the best suite for each pet from the variety of accommodations. We keep an eye on how the pets are doing and if necessary move them around to insure their comfort and provide them with a great vacation. Our Facility is climate controlled with AC/Heat including pex® in floor radiant heat syatem for our K-9 guest. We have a full back up generator for emergencies and every room is connected to our smoke and fire alarm system. We use air purifiers, dehumidifiers, ceiling fans and exhaust fans for the Health and comfort of your pet, water is available 24/7. We have a full service kitchen with all the amenities neccessary to care of the pet’s needs. Each pet has a private inside suite out of sight of other pets for their den style creature comfort. We provide thick rubber mats and artificial lambs-wool bedding to our non-chewing guest free of charge. All our pet suites have attached outside runs with Clear View Doggie Doors that allow them passage at will to their outside run area measuring up to 120 square feet. All doors are closed down at night for safety and a quiet night’s rest. All the outside Kennel Runs are made with 1 1/4” mesh X 11 Ga. Chain Link so that pets can safely play along the fence lines beside other pets without the dangers of getting hurt. Most of our runs average 22 feet in length and are positioned out front between our facility and the driveway for a full view of the daily activities. We also have a few runs located on the backside for pets that prefer more privacy. We built what we call “pee walls” 11 inches tall between the runs to provide protection against pets spraying one another. This feature provides cleanness without giving up the view of everything around them. All outside runs have wire covers to keep climbers in and have awning covers that serve as a porch for added protection against sun and rain. Platforms for lounging are built in each run and a perimeter fence surrounds the entire facility. To keep pets from digging out the kennel base was made of wire & concrete that was sloped towards the center for good drainage. We then put 6-8 inches of small smooth river-rock gravel as the top dressing in all our outside runs and the pets love it. The effect of the pea gravel for dogs is similar to sand for humans. This is the best surface to use for cleanness, better exercise, and it provides cushion for joints and little paws. The design of our facility encourages pets to exercise during the day and sleep during the night. When the pets are comfortable after having an exciting day they sleep quietly at night. If any pet has a problem we will be the first one to hear it from our home. Love, supervision with experience and fresh water are always provided. Treats and toys are offered. Music plays softly in the background at all times. Owners are requested to bring their pet’s food because it is better for them to continue with the diet they are used to eating. We do give medications as provided and instructed by the owner. You are welcome to bring personal bedding and toys from home as long as it’s washable and ok if it gets damaged or destroyed while here. The “Inn” is located under our home and is the first section you see when you drive in. This section includes all the standard amenities we offer plus the “Clear View” doggie doors in this section are made with Lexan® and appear to be indestructible. The outside runs range in length from 22 to 30 feet long. We recommend this section for chewing pets because the doggie doors. The “Club” section is located beside our office and has all the standard amenities we offer plus we installed clear vinyl flaps in the doggie door opening for softer in/out movement for sensitive pets. This section has the most variety of accommodations. This section is not advisable for chewing guests. Located between our Office/Grooming Spa and the Inn with all the standard amenities we offer. It is a section just for small pets that like lots of activity and love to run. The inside suites are constructed with 4 feet high solid walls beneath a row of windows for lots of natural sunlight. These suites have through the wall style doggie doors with double vinyl flaps like your pets might have at home. The outside runs are built like our other runs and are about 22 feet long. Play Yard time is an additional service that is available for unleashed playtime in an area with room to run free inside the protection of a large fenced yard. We play with the pets during their time in the yard, throwing a ball, a Frisbee and give lots of petting with praise. This is individual playtime. For safety reasons we don’t put pets together that do not live together but we do supervise as family pets play together. On special request from both owners we will allow pets to play together with their familiar friends. 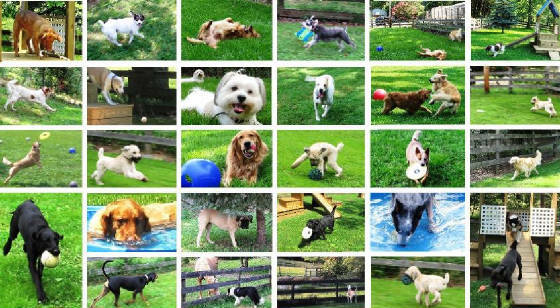 Pets in the Play Yards seem to know they are special and appear to show off to the pets watching from their runs. We offer three types of play yards to suit the needs of each pet visiting with us. The Puppy yard has six foot chain link fence surrounding it with terraced steps to run up, down & around and a small pool for pups to play in during the summer. The doggie yard is enclosed with three-board horse fence and covered with four-foot high anti-climb fence wire. It is located out front on a large natural grass yard between the driveway and our field. The hillside yard is surrounded by six-foot anti-climb fence and is built on a grass-covered slope of the hill where muscles will get a big work out. This yard is located between our home and the nature trails that go up the hillside. This yard is the choice for pets that are jumpers and is also great for strong active pets that need more of a work out. Walking pets on our nature trails is an additional service for those guests that go on walks regularly at home. This service is offered to pets that have a similar routine given by their owners at home and it allows them the feeling of exploration with more one-on-one attention. All pets must be walked on a lead outside the fenced areas. Walking one at a time is best. On special request we will walk more than one at a time, if the pets are used to a brace lead. Nature Walks are done according to the condition of the pet. If there is question of health or safety the walk will be confined to protected areas. A pet in good condition can go on extended walks all around the property, up the wooded hillside trails, to our barn and grass area around the pond. Many pets have enjoyed a pass by the barn where the sheep hang out, up the hill where the cats sleep during the day. Some of our visitors have enjoyed a trip to Larry’s shop to say hello and get a friendly greeting while they check out the activity there. Inside play time in a recreation room set up with all the creature comforts of home. Here your pet can relax on a human lap for a belly rub, back rub or snuggle up for a movie. Pet’s can also check out the toys, play games or can choose to go visiting around the inside of the facility. Working out in our Swim Spa can be a great way for your pet to stay active or get into shape. It's a good cardiovascular workout, improve muscle strength, stimulate lymph circulation and increase range of motion. Water makes exercise weightless without the jarring effects of gravity, hard surfaces and the 85 to 87 degree warm water is soothing. It's great fun for all pets but can be beneficial to pets with joint pain, arthritis, dysplasia and many other physical issues. Hydrotherapy is great exercise to help increase stamina, improve balance, increase strength, loosen tight muscles, increase flexibility, decrease lameness, increase coordination and is known to hasten healing. Kay works with the pets on a one to one basis, taking time to gradually introduce them to the water slowly with lots of praise. Some pets will take to the water at once while others will require several visits before loving it. Yes, we have canine life vest in all sizes and several water toys. There is a after swim rinse, towel dry and then hair drying in our grooming room. Longer hair pets can then be groomed by our groomer if desired. Dirty dogs will be required to have a pre-bath before going into the pool. Pictured above is "Tulip" during her first Swim Spa Session.